Join us as we kick off monthly community yoga classes at First Choice Chiropractic! 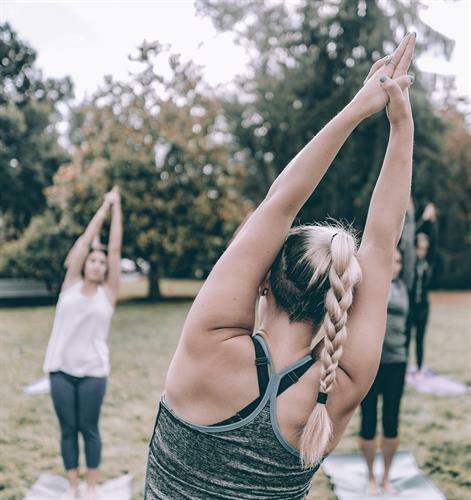 Your wellness is our priority, and we're coming together to provide you with the perfect space to enhance your mind, body and spirit, in whichever way you choose to grow. My name is Tawny, and I’m a certified yoga instructor with three years of teaching experience. I'm excited to bring to the community what I love practicing and sharing with as many people as possible! This class will be a 60 minute vinyasa flow. If you're not familiar with the term vinyasa, that means we flow from one posture to the next. I teach to ALL levels, so whether you've been practicing for years or it's your first class, you are welcome to join. These classes are donation based, as finances should never keep someone from practicing. Suggested donations are $5-10 per person. Be sure to arrive 5-15 minutes early to get set up and settled in. Wear comfy clothes that you can move freely in. Bring a yoga mat and water bottle. Please arrive 5-15 minutes early to get set up and settled in. This is a donation based class with a suggested donation of $5-10 per person.